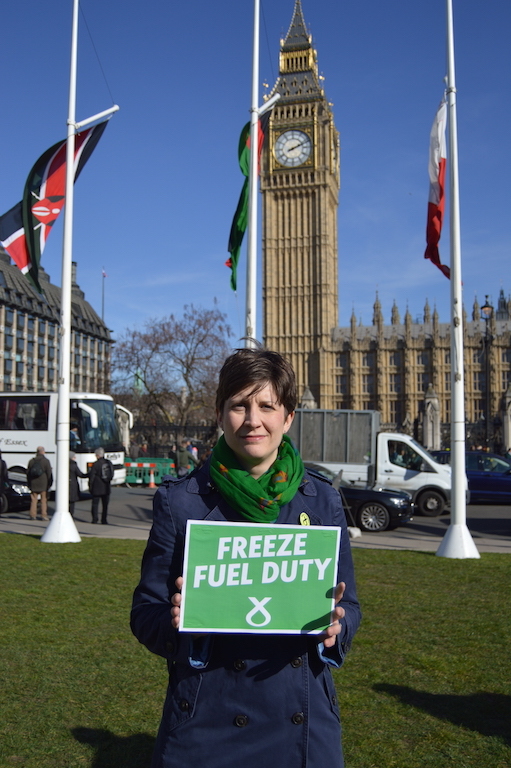 Glasgow SNP MP, Alison Thewliss, has today (Monday 14th March) called upon Chancellor of the Exchequer, George Osborne, to cut fuel duty when he delivers his budget to the House of Commons on Wednesday. “Drivers in Glasgow can’t afford a hike in fuel duty. Raising the price of petrol and diesel just now would be bad for the economy and bad for household budgets. A raid on fuel duty by the Chancellor would squeeze the pockets of Glasgow families – it would put at risk crucial economic growth and job creation. Small businesses in particular have benefited from the freeze on fuel duty and I know that any increase in business costs would also be unwelcome at this difficult time. “We know that over 70% of the current fuel price constitutes tax in the form of vehicle duty and VAT. The 5 year freeze on fuel duty has, as of January 2016, saved UK households on average £104 per year. Things like the freeze on fuel duty, as well as the SNP Government’s council tax freeze, have helped alleviate pressure on family budgets but we know that economic recovery is still fragile and that can’t be put at risk by a hike in fuel duty.